I am now a travelling lady! ... or I will be...I'm really quite excited about it all. I'm really looking forwad to my trip to Palm Springs - not just for the amazing time I'll have - but I'm going to travel to more places in less time then I ever have before. What do I mean? I think I mentioned that my grandpa took care of my flights for me using his points....well points have their limitations. Each flgith will have three transfers! So here's what it's going to look like - I'm interested to hear if I'll be landing in your state!? so - it's going to be pretty intense - but I have four whole wonderful days to spend in Palm Springs with my Best Friend!! My mom said that she's looking forward to work calming down some - because she misses me.... I hadn't realized how absent I've been lately. Well - work mostly. It's been pretty crazy lately. Every April our company goes through a salary review process - everyone's salary is reviewed. There is a lot of work that goes into it. First - a lot of market research is done to see how we rate against other's in our industry. We provide the data to our management team, they advise the division/group managers and decisions are made. Once salary decisions are made - we have to produce letters - every salary conversation = a salary letter....it's a lot of work. I won't go into more detail than that, but needless to say, there's been a lot of overtime lately. That said, the extra hours are great, with it I have already reached the max in my OT 'bank' (we choose if we get it paid out if we bank it to a certain level - I bank to 75 hours) and I've got another 14 hours (so far) that will be paid out on April 1st. That will sure make my trip to Palm Springs easier. Many people are just starting to assess the damage from this recession, and realizing that they still need to reduce their debt load. They know now that credit can be great for liquidity when in supply, but it can also be an anchor when it goes unpaid. Here are some creative ways to find cash to pay back your credit card balances, a cash advance, or just stash money away for another rainy day. You can often find extra cash in your monthly budget by reviewing your insurance needs on a yearly basis. Auto insurance or home mortgage insurance rates can drop over time as the value of the asset depreciates or a new company offers more competitive rates. Take the difference and apply it your loan repayments. One of the easiest ways to save money is through eliminating costly items in your diet. While not everyone will want to try to be a vegetarian, you can reduce the amount of alcohol or convenience foods you buy. Over the course of a month you can save $50 or more, if you start to review your food budget in detail. If you grow your own veggies, you can reduce it substantially more. Anything that hooks you into a yearly contract is a money leak. That includes cable television, phone contracts, or monthly memberships. With so many different services out there that don’t’ require you to make a one to two year commitment, it’s not necessary to get married to your service company. Substitute hulu.com for cable, a prepaid cell phone for a landline or expensive contract, and just say no to the gym. Walking is free. For every $50 to $80 you save on each service a month, you can direct that towards your debt payments. Today Jordan and I renewed our tenants insurance! I increased our contents coverage from $15,000 to $25,000 - and the cost only went up by $8 a year! The total was $152. We decided it was worth it to increase it because, as of late, we've been purchasing more valuable items - such as our new couch and our new set of pots and pans. On top of that, I had a great conversation with my mom and her sister this past weekend - and I realized that it would take a lot of $$ up front to replace everything that we have. We have a house full of things - two bedrooms worth of furniture, camping gear, clothes etc. Sure, a lot of that stuff we got on sale - but when it comes to insurance they coverage what you replace (at least the kind of insurance I have). So - yes I got my kitchen table for $100 - but to replace it - maybe I'll have to spend $500, you never know until you're in that place. I love the feeling of knowing that if the worse happens (flood, fire, theft, my horse freaks out....whatever) - we're covered. Now - I was told it would likely arrive on March 26th - but I'm still getting nervous. Why? I asked one of my friends on the list of people they call and hey haven't been called by Passport Canada yet. I was going to use the tracking option with Canada Post to see where it's at, but I forgot my receipt at home - so I'll have to wait until this evening or tomorrow to do that. From Saturday's post you can see that my weekend started out well! I stopped by the farm where Starlight is for a quick visit before heading to BC for the weekend. I spend some time with my parents, my Nanny (my dad's mom who is in the hospital), my Grandma (my mom's mom), two aunts (my mom's sisters) and a couple cousins - I did some power visiting! Jordan stayed in the city to put some hours in at work over the weekend which was too bad, but we'll be heading back for Easter. My Canada Student Loan is down to $1,639 for a total student loan debt of $6,843 – wahoo! Finally under the $7,000 mark. Our house fund is coming along really nicely. We’re at 41.72% of our first goal which is 5% of $250,000. Isabelle actually gave us $200 last night to add to this account. She really appreciates all the energy and time we put into helping her out around the house and doing shopping. We’ve never asked or expected anything – and when we try to say no, it seems as if it’s insulting her. So, we’ve given up saying no – and just taken to being very appreciative with lots of hugs (they are her favorite). My emergency fund and RRSPs have been pretty stagnant the last couple of months – but that should change once I’m back from Palm Springs. I managed to put $25 into my Christmas fund – I’m not too worried about that one, but I’d like to have closer to $1,000 by December vs the $500 I had last year. I’ve deleted my clothing fund as I’m taking that $475 to Palm Springs with me – for whatever extra expenses come up. They’re will be some clothes I’m sure, some food and beer. I’m not sure how much to chip in for accommodation as I’ll be there for four full days (and two sort of quarter days) – but Best Friend is looking into that. I’m planning on buying some American money today/tomorrow once the transfer goes through from ING to my main bank. That’s it for updates – have a wonderful weekend! Things are about on track - I'm not able to put as much into my planned spending/saving accounts because I had a couple extra expenses this month. Number on was my passport application which was $87 and my cell phone bill was due $45. The other $100 on my visa was just some odds and ends here and there. Thank you to those who left comments yesterday - I could tell the responses were heartfelt and thoughtful. Jordan and I talked some last night and he is happy with whichever choice I make. I think, depending on the raise, I will likely funnel the extra money to my student loans to wipe them out. Once that's done and the trucks paid off - we can look at if we want to make changes to how we have our joint accounts set up. Question for Couples - When do you put more in the pot? Jordan and I are at a point where things are humming along really nicely. We have our joint savings account for our house fund – which we each contribute $150/bi-weekly too and we have our joint chequing account for rent and the household utilities. We also hold roommates damage deposits in this account. We each contribute $287.50/bi-weekly – which covers our share of rent/bills. On to the variables – Jordan and I each contribute $100/bi-weekly to our ‘food jar’ so the division of grocery/personal care/cleaning supplies is split evenly. There ends our ‘joint’ financial endeavors. We usually split costs of eating out or other entertainment, but it’s not clearly defined – and that works for us right now. When it comes to large purchases – we usually talk about them first, but at the end of the day we each still have our own pots of money. Now, here comes my question. April is salary review time each year at my company – and I’m likely going to get a raise of 2% (not significant enough to change things) however; I may get a boost from $47,000 to $51,000….That’s pretty huge. That’s close to 6.5% - which is significant. I think that if my income gets that big of a boost – I should put more into the ‘pot’. I figure – a gross increase of $4,000 will net me about $107/bi-weekly. Right now – Jordan is very aggressively paying off his truck and thus his discretionary income is not very flexible. If I put more into joint he would have more flexibility in his budget. I’m wondering what you do in your relationships – and what you think is fair? I was thinking maybe I would contribute $50 more to groceries (and Jordan would keep $50) or maybe it would be easier to adjust our joint account contributions to say $260 biweekly for jordan and $315 for me? or Does it makes sense to just leave things alone - we've been together for two years now. To help give some context, I’ll share an average snapshot of my bi-weekly budgets and Jordan's. I have two of Jordan's below - so you can see what the month looks like. We've gone a long way to find some balance between each pay period - but they are still lop sided. You can see one week he has about $55 for un-budgeted expenses and the next he has about $175. Olie is the lunch truck that comes to his place of work every day and Telus is his cell phone bill. We're getting better at making lunches - but realistically there will usually be a cost to this. Of course things like horse board, car insurance, the gym and our cell phone bills only happen once a month - this is reflective of what we have left over on any given pay period. You can see that my car insurance costs more then Jordan's but my cell phone bill is cheaper then his. There are also some expenses that are different. Jordan has a gym membership ($54/month) and I have a horse ($165/month). So that was the current picture....if I get a raise - and have an extra $108/biweekly - how much do you figure is reasonable to chip into our joint pot and how much should I keep to funnel into savings and debt repayment? I've been going back and forth between using vacation time or using banked overtime when I take a week off to go to Palm Springs. Why the back and forth? Up until now I was planning on using my vacation for camping trips in the summer/Christmas and using my banked time to pay of my student loan debt (I can just request a pay out if i don't want to use it). I've decided to use some of each. With all the upheaval at work right now I'm sure I'll bank a few more hours between now and the trip. So I think that I'll use 2 days of vacation and 3 days of banked time - That way i can still use a lot of those hours for debt and keep some vacation time for Christmas. Speaking of Palm Springs (again).....what do you all think would be a good way to thank my grandfather? I said thank you on the phone a couple of times - but I don't really feel like that's enough. He doesn't really have any hobbies....he still works (even though he's technically retired). He's passionate about his family and about giving (he still tears up from the donation our family did in his name to Free the Children for his birthday). Today's is a short post, but a good one! Jordan and I received our tax returns 6 days after we filed them (using e-file)! The same day we took the money and applied it to our debt. Jordan put $400 towards the truck loan and I put $450 towards my Canada Student Loan! It felt so good to put a lump sum on those suckers. The truck loan is now just cents under $1,100!! My Canada Student Loan is now $1,887 and change - for a total student loan debt of about $7,090! Palm Springs is a Go! I have the most amazing family! My mom recently went to Las Vegas with my grandparents. On that trip it came up that my Best Friend had invited me to Palm Springs and I was sorting out whether I could go or not. My Grandfather, in passing, told my mom he thought he might have enough Airmiles for a trip like that. I wrote last Thursday, about all the things I figured I needed to organize to be able to go - one of the biggest hurdles would be money (next would be getting my passport and approved time off work). Well, my mom read that post - and unbeknown to me she e-mailed my Grandmother and asked if Grandpa was serious, because if he was my trip was coming up fast. Well last night my mom called me - my Grandpa is going to fly me to and from Palm Springs with his Airmiles. In half an hour, I'll call him at work to confirm the dates that i'm flying and then at lunch I'm taking off for an hour - or so - to drop off my passport application. Processing times are about 10 days right now - and there are 16 (business) days until fly day. It's close. Real Close. It's all going to come together. I mentioned on Saturday that Shaw came to install our TV - well something happened while the guy was here. I was impressed to begin with because despite which appeard to be a severe hangover - the technician was professional and looked into our internet issues while he was here(the single was dropping a lot - but when we had it, it was strong). He put an ampliphier box back (which the last tech had taken) which is supposed to allow everyone to get cable in their rooms or some such thing. He changed a cable which looked like it had been spliced poorly (the one in our room - behind the cable hook up in the wall where we hook up to the internet) & our 'nitro' high speed internat promotion ended. We still have high speed internet - and Shaw only gave us that promotion b/c of some other issue we had 6 months ago (can't remember what it was now). Jordan wasted over an hour on the phone with their 'tech support' last night just doing different speed tests....which all had the same result = slow. The best that they could do was send someone to check on the modem on saturday! If it doesn't improve soon - i'm calling customer service. No way I'm paying for the internet when we can't use it. Student Loan Update: Need $240/bi-weekly. I got off to a bit of a rough start with my debt repayment goals this year with a family emergency that came up in the beginning of February. Now that I have settled that – I’d like to re-visit one of my goals. My primary goal this year is to pay off my student loans and finally become debt free. As of today, I owe $7,539.90. I owe $5,204.07 (2.25%) to my Alberta Loan and $2,835.83 (4.75%) to my Canada Student Loan. I’ve mentioned this before, but to any new readers – I currently focus lump sum payments on my CSL because it has the lowest balance and the highest interest rate. My default repayment schedule is $75/month to each loan. So I did up this little chart on my spreadsheet to see what I need to do to get these suckers paid off by the end of the year. I’ve added interest but considered the total interest I would pay for the year if I didn’t pay off any of the balance rather then figuring out the interest owing after each payment made (much easier to figure out and I prefer to round up). For context, I have 10 monthly payments left and 21 pay periods left. It would make the most sense (to me) to pay an additional $240 to my Canada Student Loan until it is paid off, and then make that payment plus the $75 default payment to my Alberta Student Loan once the first is paid off. In my student loan plan of attack post, I thought I could get away with lump sum payments of $175 - but I now think I need this extra $65 bi-weekly to make it. Does that make sense? I'm a missing anything? Is this doable? I've looked four pay periods ahead (until the end of April) - and it looks like I can IF IF IF I stay away from my credit card and stick my variable spending allotments and don't go over. I talked to the boss lady last week and althought she didn't outright say I couldn't go, it's not a good time - to take time off. There's one other person that's taking vacation time that week and we're already short staffed as it is. I'm going to keep saving and getting things organised - just in case - but it might not happen afterall. My Best Friend has invited me to Quebec the following month - so that trip may be more feasable - work wise. Not too long ago I told you that Jordan and I were making the TV switch from Bell to Shaw due to an amazing offer! Well, the Shaw guy just left and we're all hooked up! We will now have two bills each month instead of three - Shaw and Enmax. We'll have a final bill and cancellation charge from Bell, but after the deals we get with Shaw - it'll still be worth the switch. I also mentioned a while back (this is six months ago) that we got a deal on our Shaw, well today - that deal was up. I had spoken to Shaw twice before to make sure we wouldn't be billed for the promotion they gave us - and they messed it up. The bill is $10 higher then it's supposed to be. Ack! Way to go Shaw.... I'm on hold with their customer service now, so hopefully it won't take too long to fix it... by the time i finished writing this post, I had spoken to Shaw and they had fixed the billing mistake! We split this by 3 for Jordan, myself and our roommate who just moved out (because these bills are for last months services) and we have a grand total of $136.30 each. Roommate had given us a damage deposit of $250 - so we owe him $113.40. We'll write him a cheque, give him a call and leave it in the mailbox for him to pick up this weekend. Once again, it's time for my bi-weekly budget post. Things are starting to get back on track. This week I'm finally able to start contributing to my savings goals again. I've got $90 slotted for my clothing fund - which may turn into a travel fund (we shall see - I'm taking to my manager today about time off for Palm Springs). My variable allotments for transport/food and entertainment are the same as usually. I have an extra $20 in transport b/c I think it's just about time for an oil change but at the very least I need to top up my washer fluids and what not. I'm set to do a $200 lump sum payment on my student loans. Car insurance is due during this pay period and I have a $200 visa payment to make. All in all, I'm feeling pretty good about this. My Best Friend (BF) has invited me to Palm Springs. This is a big deal. I’ve never been anywhere. I’ve never left Alberta/BC – the two western provinces of Canada. I don’t have a passport. I don’t have any savings for travel. I so so so want to spend some quality time with her. BF lives ohhh…about an 11 hour drive from me – so we don’t get to see each other as often as we like. I've sent an e-mail to my boss (she is out of town for a couple of days) asking about the time off – there are two other people taking time off in April, so we’ll see how that goes. The Money. Oi! The Money. I checked on WestJet and if I CAN'T get any seat sales, flights will be about $1,000. Lodging would be free b/c BF's parents have a place that we can stay at - so that would be amazing. I have absolutely no clue how much to budget for food, fund & beer. Can anyone help guesstimate that? I'm thinking anywhere from $500-$750. what if later never comes? I've noticed that lately there has been an increasing number of personal finance bloggers that have been 'found out'. Their anonymity has been challenged and/or they have been outed in a public way. Often, the result is that these bloggers close down their sites - some start again under different names - some never come back. I think this is so sad - that people have come to the blogging world looking for an outlet to share and place where they will find support and guidance and maybe even friendship - and they get turned out so to speak. It's particularly tragic that they seem to be outed in a negative way. On the curtails of that, those who follow me on Twitter may know that after a few glasses of wine too many I became a tad loose lipped and told my best friend that I have a personal finance blog. I think she was fairly surprised - but we didn't get too much into it. Well, last week she asked for the link to my blog. I was really nervous at first - for me, this blog is a like a diary for my personal-finance related thoughts....and giving the link to a loved one on purpose - wouldn't that be like leaving my diary out in the open? I thought about that some and came to the conclusion that I think people don't talk about money enough - it's taboo! Wouldn't I be perpetuating this ridiculous taboo by not sharing the link? Didn't I share it with my boyfriend, my mom and my brother (okay - my brother was mostly b/c I needed HTML help when I first started). Of course I should share it with my best friend! I can understand why a lot of people choose not to be public, and you won't see me putting my last name out their anywhere - but I think that I'm at a place where I'm comfortable sharing this blog with a few close people - best friend included. Of course, with it being my choice to share this blog with her, it feels much different then if she had just figured it out. I hope that no one finds me out who has intent to cause hurt and I hope that if that ever happens I have the wherewithal to handle it in a way that lets my writing survive (even if I have to change blog names). So, how private/public are you with your blog? Have you shared it with family/friends - or are you truly anonymous or public? That was one other thing I accomplished over the weekend. I did my, Jordan's and my grandmother's taxes. I've used QuickTax for the last several years and so love how easy it is. You can use their Easy Step process which asks you a bunch of questions or you can just fill out the forms page by page. I normally really like the Easy Step - but this year it was like they had dumbed it down so much it was confusing! I went back and forth quite a bit between Easy Step and Forms to make sure I had done everything correctly - but after using the software for so long, it was pretty simple. Our refunds will be just about the same - we're each getting about $440! Not too shabby. My grandmother is getting about $2 back (she has no income, just receives government benefits). We had originally planned on putting that money towards our house fund, but we're both concentrating on getting our debts paid off - so instead Jordan's will go to the truck loan and my refund will go to my Canada Student Loan. It'll feel pretty great to put a lump sum on the debt like that. It will move Jordan's debt free date up a month to June, 2010 from July, 2010 and make my journey to being debt free in 2010 that much easier. Canada won gold in men's hockey!!!! It feels like this weekend has lasted forever - which is really weird because usually they go by so quickly. On Friday roommate number 4 and 5 moved a bunch of things to the house - so naturally after work I did a bunch of housework and what not. We had to clean out our spare room, which we'll be renting (fully furnished) to roommate number four's friend (roommate number 5) for a couple months. I wound up vacuuming the stairs which only served to remind me that it should be done wayyyy more often! how often do you vacuum by the way? On Saturday we did a tonne of running around! I had to renew the registration for my car (about $75 and we picked up a bra that was getting repaired ($15 to fix a $200 bra) - later on Jordan got a desk and an office chair so he can work/play more comfortably on his laptop, and I picked up an inexpensive shelving unit for all the scrapbooking things that i'm slowly starting to acquire. When we finally got home (we did a lot of price comparisons which meant driving all over the city) - we wound up completely re-arranging our room and building the new furniture - it looks pretty great in here! Today we got up early to do a Costco run for my great aunt. I've never been to a Costco when it opens at 10:00am on Sunday morning and I don't think I'll ever do that again! There was an insane line-up! 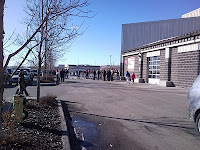 Seriously, a line up for Costco. There weren’t any special sales, it was just an average Sunday afternoon. I made Jordan take a picture for the sole purpose of sharing it with you. Once at my aunts we did a short computer lesson (she's 80, just got a laptop and wants to figure this whole e-mail thing out and did a few odds and ends around the house (this usually involves changing a lightbulb). We got home in time to watch the hockey game. In the middle of that new roommates finished moving in and shortly after old roommate finished moving out. phew! Jordan and I finally got around to folding all of our clothes...I think just about ever last scrap of clothing we own was in the basement on the couch. It was pretty bad, but now everything's all put away in it's place. It's going to be nice waking up in the morning and knowing where to find socks! We also wound up with a big box of clothes to go to charity. At the end of the evening I decided to try my hand a bread again - this time I made two loaves, 10 buns, and 10 cinnamon buns. So far so good!! This time I let things rise a bit better so i think the results will be much tastier (also used half whole wheat flour). Aside from all of that - we've been intermittently working on a 1250 piece puzzle that my great aunt gave us the other day.... and man is it hard! But it's hours of FREE entertainment - and who doesn't love that? !